Want to connect with Krishnan? 1. Learn a new recipe and participate in the preparation, and cooking process. 2. 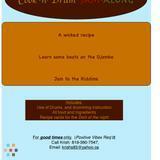 Learn the basics of hand drumming while the food is cooking. Ottawa, Gatineau, and Montreal Regions. I specialize in exotic flavours, and unique recipe ideas. Accommodate all pallets and requirements. (Gluten,sugar,Veg,Vegan, Meats, Spicy, non-spicy, Raw, Deserts…) and traditional recipes. I am red seal chef and graduate from Algonquin College with International and Canadian experiences.